The Prequel/ Spinoff of one of the Osamu Tezuka´s Clasics. 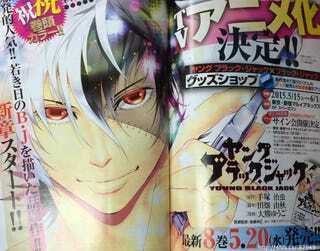 It has been revealed on Akita Shoten Champion that the Manga of Young Black Jack will get an Anime Adaptation. The Illustrator Okuma and the Author Tabata (Ninja Slayer) will start a new arc of the manga and also they will make an autograph event to commemorate the Anime adaptation of Young Black Jack on May 23 in Shinjuku. Young Black Jack is a prequel of Osamu Tezzuka´s Black Jack wich features a Maverick Doctor who practices without license, but is soo good that the people go with him, even that he ask for lots of money.